Although there were rich days during his time at the church, Turner leaves the church where he came to it: in financial crisis. In 2012, Turner revealed to his fellow executive elders and lead pastors that the church, financially speaking, was “in a big mess.” Today, I reported that Mars Hill Church’s chief financial officer Kerry Dodd said the church is in “the most trying circumstances in our church’s history.” Layoffs and location closings preceded Turner’s announcement. Turner leaves a gap on the executive elder board with no public announcement about how that vacancy will be filled. As the chief operating officer of Mars Hill, Turner oversaw the day to day operations. It is not clear who is doing that at present. I just returned from the Conference on Faith and History which was held at Pepperdine University from September 24-28. On Saturday, I presented a paper as part of a panel titled, Professors, Prisoners, and the Polls: Engaging the Past in the Public Square. The session was chaired by Dwight Brautigam, Huntington University. Other papers given were: “In God We Trust”: Teaching Faith In and Through the U.S. Capitol, by Fred Beuttler, Carroll University and former Deputy Historian for the U.S. House of Representatives, and Teaching History Behind Bars: The Public Platform of a Texas Maximum Security Prison, presented by John Wilsey, professor at Southwestern Baptist Theological Seminary. The featured commenter was Jonathan Boyd, InterVarsity Press. The abstract is below, the full paper is at the link. David Barton is a popular Christian writer who specializes in making a public case that America is a Christian nation. Immensely popular with conservative Christians, Barton distorts historical events to support conservative political positions in the present day. Up until recently, left-leaning and progressive critics have led the way in calling out Barton’s historical errors in the public square. However, in 2012, David Barton published a book on Thomas Jefferson that generated much public reaction, most of it critical, from Christian scholars. Along with co-author Michael Coulter, I published a book length critique of Barton’s work on Jefferson. Eventually, publisher Thomas Nelson listened to the critics and pulled Barton’s book from publication. This episode was unprecedented in that a Christian publisher pulled a New York Times bestselling book due to vocal public complaints from Christian scholars. What can be learned from this situation? I take the position that Christian historians and other scholars should engage their brethren in critical scholarship when other avenues have not brought resolution. Myth-busting in this situation can serve the Kingdom and our vocation by placing a quest for truth above narrow in group interests. In-group pressures are often so strong that no real change will occur if those within the Christian community do not raise issues publicly. 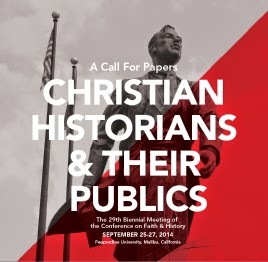 Read all posts on the Conference on Faith and History. One of Collective Soul’s best songs. Huge sound with mysterious lyrics most can relate to. 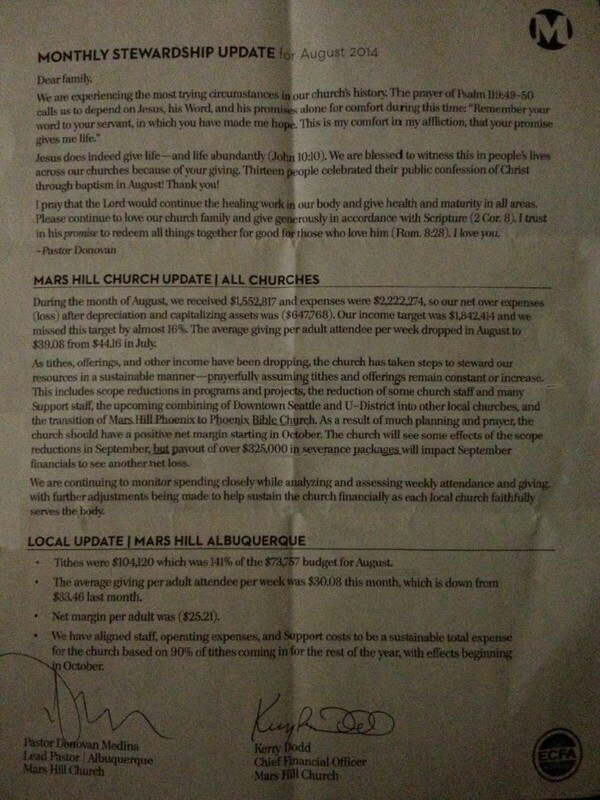 Mars Hill Church Financial Update August 2014 – "The Most Trying Circumstances in Our Church's History"
During the month of August, we received $1,552, 817 and expenses were $2,222,274, so our net over expenses (loss) after depreciation and capitalizing assets was ($647,768). Our income target was $1,842,414 and we missed this target by almost 16%. The average giving per adult attendee per week dropped in August to $39.08 from $44.16 in July. Reports from insiders are that September’s giving has been much worse church wide. According to this letter, Mars Hill’s CFO Kerry Dodd expects another loss in September. The memo projects some optimism that current giving will level out and return October to more positive territory but, according to my sources, giving is down again in September. Also, they will begin paying Sutton Turner’s severance in October. On the upside for Mars Hill, Albuquerque bucked the trend by coming in with higher than projected giving numbers. – Tithes were $104,120 which was 141% of the $73,757 budget for August. This appears to be a more candid approach for Mars Hill and I suspect leaders at each campus received one regarding their location. Author Warren ThrockmortonPosted on September 30, 2014 Categories Mars Hill ChurchTags August 2014, Financial Update, Kerry Dodd, Mars Hill Albuquerque, Mars Hill ChurchLeave a comment on Mars Hill Church Financial Update August 2014 – "The Most Trying Circumstances in Our Church's History"
I posted last week a statement Mars Hill Church spokesman Justin Dean made to the Ballard News-Tribune about Mars Hill Ballard. He told the paper that the church was growing and I wondered how that could be based on reports from those who attend there. Dean contacted the BNT today to clarify what he meant in his statement he emailed to the BNT on September 10. “As there has been some confusion around my statement I’d like to provide some clarification. … While our Ballard church has seen recent growth, particularly as families return to church while being absent over summer months, the reality is the Ballard church is currently much smaller than it was a year ago. We do believe Mars Hill Ballard is in a solid financial position and has a great leadership team in place to effectively care for the additional people they will take in from U-District and Downtown Seattle,” wrote Dean. Readers can assess that one. Is a church growing if attendance picks up for one Sunday or people start doing what they stopped doing due to vacation? At least he acknowledges the declines. A little later in the statement above, there is another head scratcher. Ballard is in a solid financial position? Ballard is a location, not a separate church. If Mars Hill is facing the worst budget crisis in church history how can Ballard be solid? The final session I attended at the Conference on Faith and History was titled “The Christian Right and the Search for a Usable Past.” Gregg Frazer, Professor of History at The Master’s College chaired the session and provided closing comments. 1. “Fallen Walls and Open Doors: An Analysis of David Barton as a Christian Historian,” by Matt McCook, Professor at Oklahoma Christian University. In my view, McCook started out on thin ice by referring to Barton as an historian. However, from there, the presentation improved as he revealed many familiar illustrations of Barton faulty historical work. Not surprisingly, McCook called for historians to present the narrative accurately without efforts to shape the past into a politically useful one. A religiously ambiguous Thomas Jefferson is not useful to the Christian right. Walls such as have been established by David Barton must come down. 2. “Popularizing a Usable Past: The Providence Foundation, Kirk Cameron, and the Legacy of Francis Schaeffer” by Grove City College graduate Charles Cotherman who is now at the University of Virginia. Cotherman compared and contrasted Kurt Cameron’s movie Monumental with Francis Schaeffer’s How Shall We Then Live? Both efforts used history to effect the culture war and both were less than stellar on historical precision according to academic historians. However, Cotherman presented evidence that Schaeffer’s efforts resulted in the intellectual betterment of some evangelicals who went into scholarly work via Schaeffer’s inspiration. However, such results are not likely to derive from Cameron’s movie. The amateur historians recruited by Cameron are too fact-challenged to lead to any positive result. Cameron’s Monumental reflects decrease in public intellectualism. Schaeffer would roll over in his grave at the praise for the aesthetics of the Monument to the Forefathers. 3. “In the Stream of God’s Sovereign Plan”: Providential History and Nostalgia in the American Quiverfull Movement by Emily Hunter McGowin student at the University of Dayton. Emily discussed the historical revisionism of G. Botkin who is at the forefront of the Quiverfull Movement (having many children and raising them in accord with strict gender roles). Members of the Quiverfull movement are members of restorative nostalgia. Nostalgia tells it like it wasn’t. Complicit in the promotion of bad history are the media, political organizations, churches etc. who invite David Barton to speak. Historical revisionists find what they set out to find. Gregg was right on target and even though difficult encouraged Christian historians to keep “pushing the boulder up the hill” in a Sissyphus-like effort to bring historical integrity to Christians. Probably many Christians would be surprised to find out the extent of the distance between Christian historians and Christian advocacy groups on matters of historical accuracy. Ted Cruz has won the 2014 Values Voters Presidential Straw Poll. David’s historical research has helped millions rediscover the founding principles of our nation and the incredible sacrifices that men and women of faith made to bequeath to us the freest and most prosperous nation in the world. If this is his view of Barton’s historical revisionism, then, in my view, Cruz’s grasp of the founding principles has been skewed. Mitt Romney won the straw poll in 2007 and then went on to get the GOP nomination in 2012. Other than that, no winner has captured the GOP nomination. I doubt Cruz will change that trend. Dr. Ben Carson, a conservative commentator and neurosurgeon, on Friday likened the health care law to slavery. While I recognize problems with Obamacare, I would much rather pay a little higher premium than be enslaved. I admire Ben Carson for his medical accomplishments and I used to think of him as a reasonable person. In my opinion, he is tarnishing his reputation with this move into politics. Jon Foreman sounds as good as ever on Switchfoot’s new anthem, When We Come Alive. As usual on Friday, news about Mars Hill Church was posted on the website. Nothing earth shattering was shared but some items caught my eye. First, I note that Mars Hill Downtown campus is having a celebration (and a moving party). However, I saw nothing about a similar party at the University District location. U-District’s pastor Drew Hensley was one of the signers of “the Letter” whereas the downtown location pastors did not sign it. Now perhaps, U-District didn’t want to have a party, I don’t know, but the lack of mention is noticeable. Second, there is more news about Mars Hill Phoenix becoming Phoenix Bible Church. The fledgling congregation has found a place to meet on Sunday. Third, Sutton Turner is pictured in the report getting a farewell laying on of hands. For his part, Turner seems to want distance. His Linked In Profile now refers to Mars Hill Church as a “non-profit organization.” In the description (not shown), he doesn’t mention Mars Hill Church. He says he was chief operating officer for a non-profit organization with 15 sites, in 5 states serving the needs of 13,000 people. It doesn’t appear that he is seeking ministry jobs. Mars Hill Church members: Wouldn’t you like to know what Matt Rogers told the staff on behalf of the Board of Advisors and Accountability? Did you make that error too?